Mission: Bishop Gregory Homeming addresses those gathered for the opening and blessing of Donnelly House. 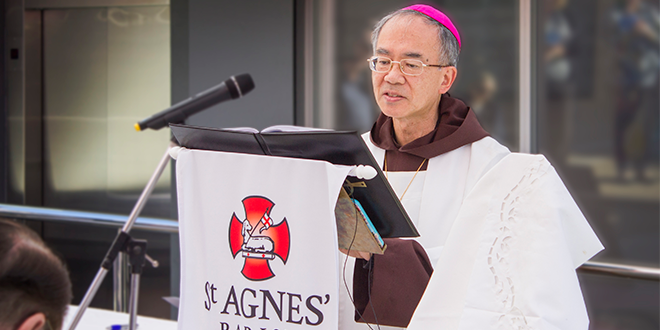 LISMORE Bishop Gregory Homeming blessed and opened a new lifestyle gateway for Catholic Care of the Aged services for St Agnes Parish in Port Macquarie in August. For more than 40 years Catholic Care of the Aged in Port Macquarie has championed the mission of St Agnes’ Parish to be the face of Christ in our community through serving others. In that time, the aged care industry has seen many changes, resulting in an increasingly complex environment. At the service Bishop Homeming spoke of the fine example set by St Agnes’ Parish in reaching out to others. “I am delighted with what I’ve seen in this Parish. This Parish in many ways is an example not simply to other Parishes, but indeed to the Diocese itself… I see here in what we are about to open today something that is preeminently of the will and the love of God,” Bishop Homeming said. The new lifestyle gateway is housed in Donnelly House and is named in recognition of St Agnes’ parish priest Fr Leo Donnelly, whose leadership and faith has inspired the parish to act on opportunities to be of service to the community. “I am delighted to be here because your people see in you, not Father Donnelly, but Jesus Christ … In calling this Donnelly House, we are acknowledging, not you Father Donnelly, but that you have allowed Christ to be present to your people through your own life,,” Bishop Homeming said. St Agnes’ CCA Director of Care Joy Walsh said the new CCA lifestyle gateway aimed to reduces stress on people trying to access Aged Care and other lifestyle services. “Donnelly House represents a new way of providing choice and person-centred specialised services, including community home care, retirement living and residential care services as well as pastoral care, lifestyle and wellbeing programs,” Mrs Walsh said. St Agnes’ Parish chief executive officer Adam Spencer said the introduction of the CCA lifestyle gateway was very much in line with the Parish’s faith mission to be of ‘service to all, particularly those in need’. “We want our community to know that if they need something for their lifestyle or their care, then this is where they come,” Mr Spencer said. St Agnes’ Parish, Catholic Care of the Aged, has grown to be the largest provider of aged care on the NSW Mid North Coast, caring for thousands of people in the community on a daily basis.